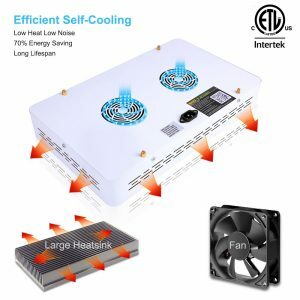 Recently, we’ve read a fair number of reviews on the best brands that specialize in LED grow lighting for home growing. Guess what company stood out in this category? 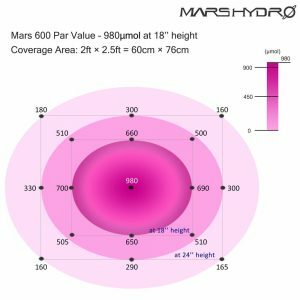 If you’re thinking of Mars Hydro, then you’re correct! We’re pretty sure you’ve heard or read about this company somewhere. But if you haven’t, no need to worry. 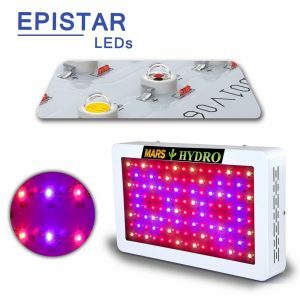 Not only are we going to talk about how awesome this brand is, we’ll also tackle Mars Hydro Beginner Light 2 Series: Mars Old Model and Mars Eco Series. 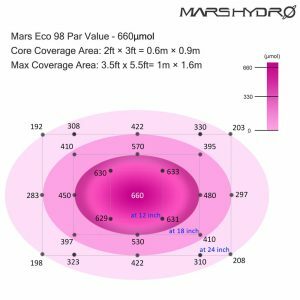 In this article, you’ll learn about the Mars Hydro’s products, the pros and cons of Mars Hydro Beginner Light 2 Series: Mars Old Model and Mars Eco Series. Also, we’ll link you to where you can purchase these cool products. Hopefully, by the end of this guide, you are able to grasp all that you needed to know. So sit back, relax, let’s grow! Mars Hydro specializes in LED grow lighting and grow tent for both home growing and commercial application. The company has been in the business since 2009. 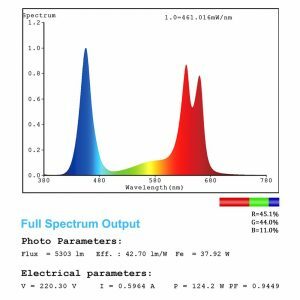 The brand has the largest variety of full spectrum lights to replace 200W, 400W, 600W, and 1000W MH, HPS, and fluorescent systems. 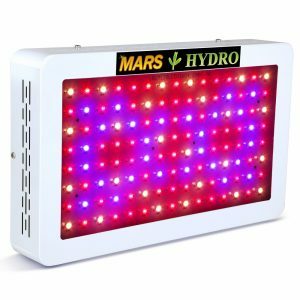 Being in the biz for nine years, Mars Hydro grow lights has an increasing reputation among growers for prices that are very competitive. The brand has been developing and perfecting its products. 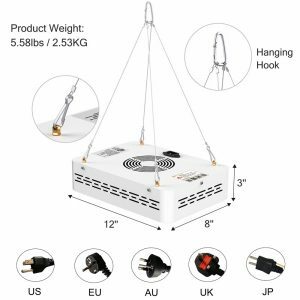 So, you can be confident that all its products including the Mars Hydro Beginner Light 2 Series: Mars Old Model and Mars Eco Series are top quality. Of course, your grow lights are great investments. But when the inevitable happens or whenever you encounter problems with your Mars Hydro, there is a warehouse or repair center available for you. You must know that there are five warehouses and repair centers in the United States, Canada, UK, Germany, and Australia. So if you are located in one of these countries, you will only be paying for local shipping. No custom tax is needed. Another that will give you peace of mind is the safety of their products. Its products are ETL/CE/RoHS certified, including the Mars Hydro Beginner Light 2 Series: Mars Old Model and Mars Eco Series. The parts inside are fireproof and the wires in the panel and power cord are UL certified. Not to forget, it has VDE socket. 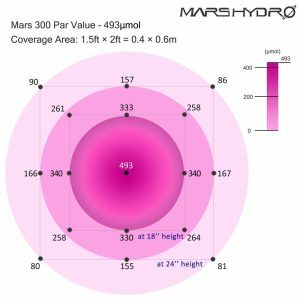 Mars Hydro, without a doubt, guarantees user safety when people use mars lights. 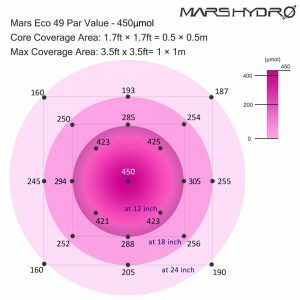 We are close to discussing the Mars Hydro Beginner Light 2 Series: Mars Old Model and Mars Eco Series. But for now, let’s talk about the package. 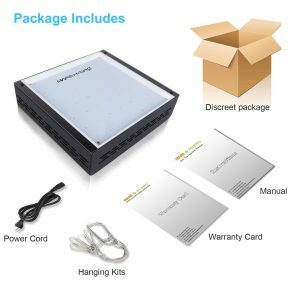 Each package comes with led grow light, hanging kits, power cord, warranty card, and an instruction manual. 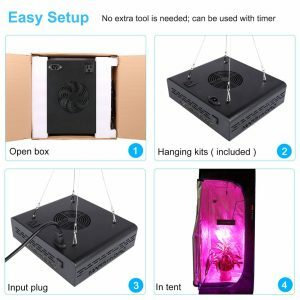 For shipping, you can expect that they can ship your grow lights within 24-business hours. 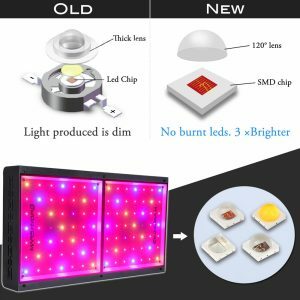 Most grow lights use 5W epistar LED chips. 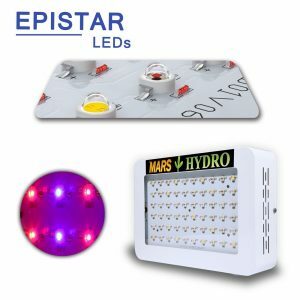 Mars Beginner and Mars Eco LED grow lights use high intensity 5W epistar LED chips. The Mars Hydro Beginner Light 2 Series: Mars Old Model and Mars Eco Series and their other grow lights are not only for growing cannabis. 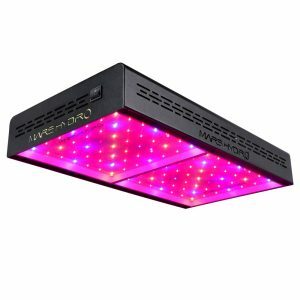 These grow lights can also be used for growing vegetables like tomatoes, peppers, chilis, lettuce, and eggplants. You can also grow flowers, orchids, bonsai, even herbs. And if you love fruits, you can grow your own strawberries and other berries too! First of all, you definitely need to make sure that you have an idea of the amount of space you want to cover with your LED lights. Each LED light has a maximum range of space that it can cover. 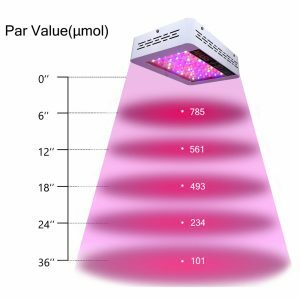 It is important that you know and understand the measurements of your grow space up to the last centimeter. 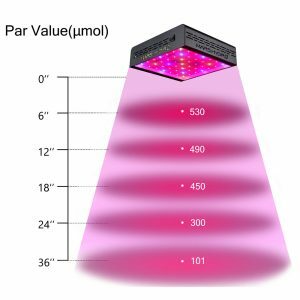 In terms of helping your plant growth, a full spectrum LED grow light goes a long way. 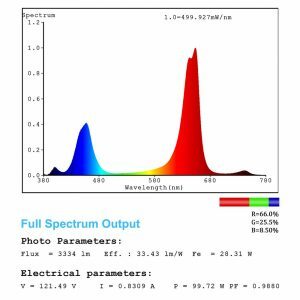 Depending on the stage of the growth, you will need red an blue spectrums, as well as infrared and ultraviolet. 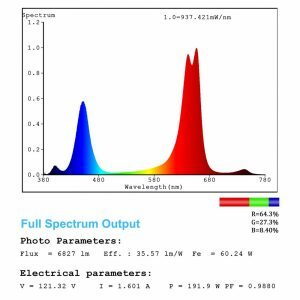 It is necessary to have a powerful light that has different wavelengths to ensure the plant’s maximum growth. 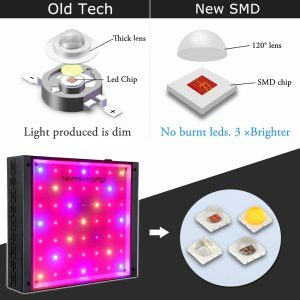 Your LED lights will need to have durability and great electrical efficiency as well. A good LED light should be operating for at least 10-12 hours a day. 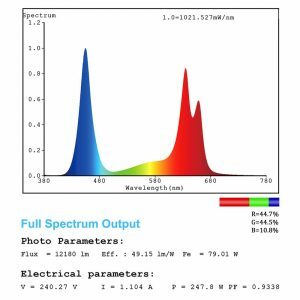 When researching a good LED light, you’ll need to thoroughly understand what the total output is (1000w, 400w, 300w etc). The higher you go, the more powerful and more likely leads to less electrical usage (and more cost effective for you). Why do you need to consider the brand and the price? This is so because lights that are of high quality yield the best results. If you are a beginner, you will want to start with a much lower priced option. However, if you are more experienced, it won’t hurt if you go with the quality and higher-priced lights. A good brand, like the Mars Hydro Beginner Light 2 Series: Mars Old Model and Mars Eco Series, has great customer reviews. So, it is a sure bet. There’s a lot of reason why you would want the Mars Old Model. The Mars Old Model is the most popular beginner light. It is ETL/CE/RoHS certified. 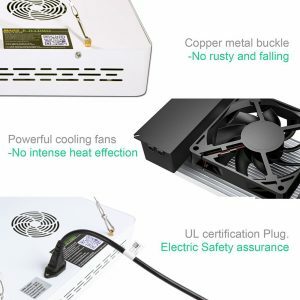 You will not worry about burning because the parts inside are fireproof and the wires inside the panel are UL certified. As mentioned earlier, Mars Hydro guarantees user safety. So, growers have nothing to worry about when they are using Mars Hydro lights. It comes with a UL certified power cord and VDE socket. 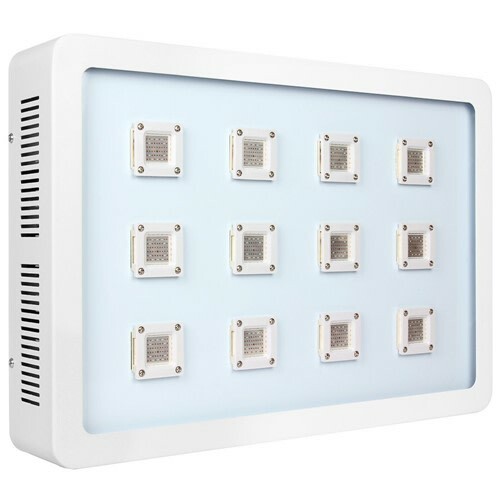 It uses high-intensity Epistar 5W LED chip. The Mars Old Model can also be used with a timer. According to the experiences of growers who used Mars Old Model, this one is great for beginners. 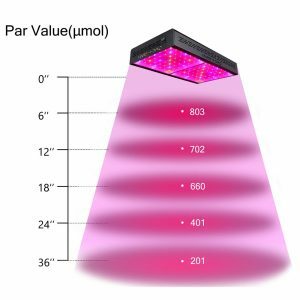 So, if you are a newbie then this grow light is perfect for you. Plus, it will not hurt your wallet with its decent price. In addition to the pros of Mars Old Model, the package comes with LED grow light. It has hanging kits, power cord, warranty card, and instruction manual. Now that you know the best things about the Mars Old Model, it is only right that we tell you its downside. You have to know that the Mars Old Model has no switch. It also has no IR. Continue reading to know more about Mars Hydro Beginner Light 2 Series: Mars Old Model and Mars Eco Series and the specifications of each of their models. Of course, we will not let you go without telling you the common technical data of the Mars Old Model. Leds View Angle: 90°/120° Mixed allows you to view. Frequency Range: It has a frequency range of 56~60Hz. Life Rating: The Mars Old Model can last up 50000-100000 hours of use. Cord Length: Its cord is 6ft long. This model provides a full spectrum for vegetables, flowers, and aquatic plants. It surely takes care of all stages of plants’ growth. 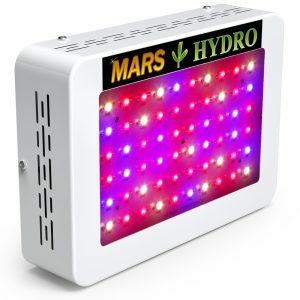 The Mars Hydro Mars 300w LED Grow Light is safe and easy to use. You just plug in and turn on. 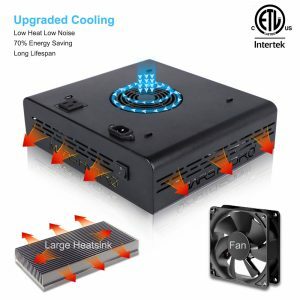 With the design of separate integrated circuit board and heat sink, a damage to one component will not cause a great deal of a problem to the whole set. 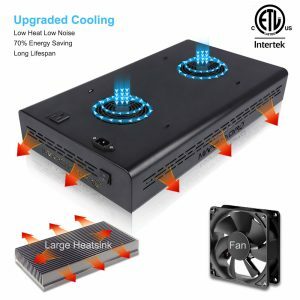 It has high speed heat dissipating fans that work efficiently to cool down the Lights and make no noise. 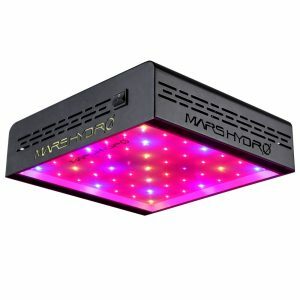 The Mars Hydro Mars 600w LED Grow Light can be used for both hydroponics and plants in soil, such as tomatoes, potatoes, pepper, lettuce, etc. It is also suitable for all indoor growing environment like the grow tent and the grow room. 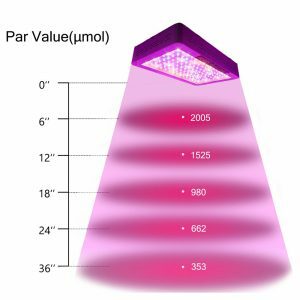 Like the previous model, the Mars Hydro Mars 600w LED Grow Light is very safe to use and energy-saving. 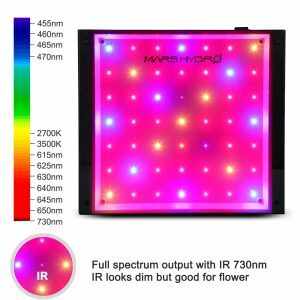 What you will love about the Mars Eco Series is that it has an on or off switch, a Daisy chain function, and an IR 730nm if you want to grow flowers. If you need to grow big flowers, there is a high red ration for that. 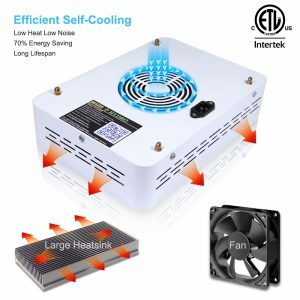 Another great thing about the Mars Eco Series is that it is equipped with an efficient cooling system and the newest SMD chip tech. So, you are confident that there will be no burnt LEDs. The only downside of the Mars Eco Series that we found notable is that it has no growth or bloom switch, only an on and off switch. 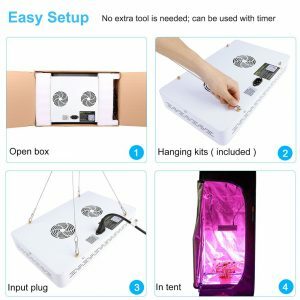 Hopefully, that does not turn you off from trying out this grow light. Continue reading to learn more about the models of the Mars Eco Series and their specifications. Before we proceed to each of the models for Mars Eco, get to know its common technical data first. This Mar Eco model is focused on the even par value. It utilizes superior 12-band full spectrum with IR to achieve maximum photosynthesis response. The greatest innovation of this model is that it has more red lights added. This is to ensure that you achieve bigger flowers, larger fruits, and have higher yields. 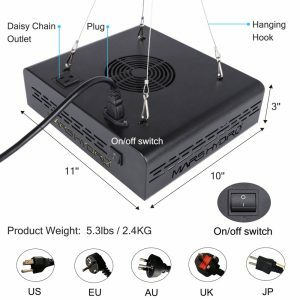 To allow more convenience and ease in the operation and management of growing plants indoor, the Mars Hydro Eco 300w LED grow light has upgraded power switch plus Daisy chain function. It consumes only 100W±10% while replacing typical 150W hps or HID grow lights, which is 70% energy saving. This model is great for 1.7’ X 1.7’ growing area at 18 inches height. You can see below more of its specs. Like the previous model, the Mars Hydro Eco 600w is also focused on the even-par value and utilize superior 12-band full spectrum. It, too, has an IR to achieve maximum photosynthesis response. There is also more red lights added to achieve bigger flowers, larger fruits, and higher yields. 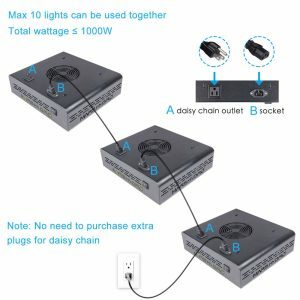 Also, you can find an upgraded power switch plus daisy chain function added to allow more convenience and ease of indoor plants growing operation and management. But unlike the previous model, this one consumes only 192W±10% while replacing typical 250W hps or HID grow lights, 70% energy saving. It is great for 2’ X 4’ growing area at a height of 18 inches. 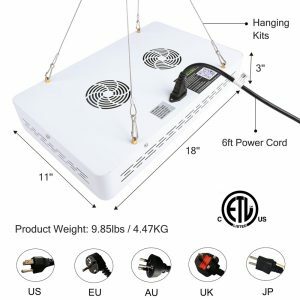 Using 2 Eco 200 watt led grow lights, it will be perfect for a 4 X 4 cu. ft. area. You can read below more of its specifications. Thank you very much, we hope you enjoyed our honest, unbiased review of this product line!